How did a scruffy handful of self-taught revolutionaries defeat 40,000 professional soldiers to overthrow the dictatorship of Fulgencio Batista? 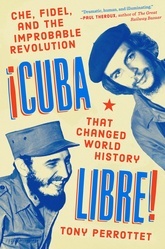 Cuba Libre!’s deep dive into the Cuban Revolution of 1956-1958 unravels the human drama behind history’s most improbable uprising. Along the way, we revel in fascinating details: How did Fidel Castro’s lover, Celia Sánchez, whip the male guerrillas into shape? Who were the two dozen American volunteers who joined the Cuban rebels? How do you make lethal land mines from condensed milk cans? Cuba Libre! is a wildly entertaining look back at a liberation movement that captured the imagination of the world—and set the stage for a buildup of Cold War tension that became a pivotal moment in history.